Nuestro proyecto pretende valorar lo que permanece mediante una rigurosa construcción de lo nuevo. No nos interesa el concepto de ‘plano de fachada’, aislada y sin contenido. Proponemos por tanto, mantener la primera crujía con su espesor reconstruyendo la estructura actual. El resto del edificio se vacía. Un vaciado interior entendido como un gran patio de operaciones que se irá ocupando con plataformas horizontales que acabaran por llenar el vacío... Sin colmatarlo. Our design is intended to enhance what remains through the rigorous construction of the new work. We are not interested in the idea of ‘the façade’ in isolation, devoid of content. We therefore propose to retain the depth of the first bay, rebuilding the present structure. The rest of the building will be hollowed out. The hollow interior will be like a large dealing room. It will gradually be occupied by horizontal platforms that will eventually fill the void... without filling it in. Between the volume to be retained and the new platforms, intervening spaces buffer the contact between the original architecture and the new and enable overhead light to spill down the glazed surfaces of the envelope, reinforcing the transparency of the whole. The massiveness of what remains contrasts with the lightness of the new platforms. 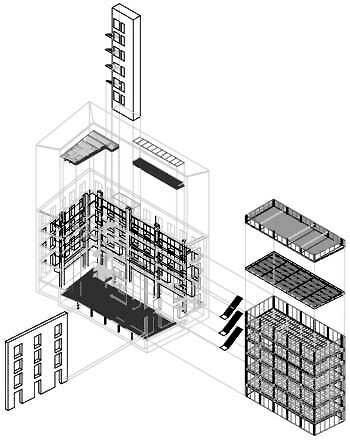 el sistema arquitectónico se completa con un núcleo elemental por e que discurren todas las instalaciones y conductos verticales (ascensor, aseos, montadocumentos, conductos de climatización, montantes, bajantes,...) este volumen prismático recorre verticalmente el edificio y se convierte, de hecho. En el motor del edificio, es la pieza que, junto a sistema de escaleras que conecta los distintos niveles, articula y relaciona las dos partes diferenciadas del proyecto. mantenemos la primera crujía como la base construida que justifica la conservación de las fachadas. Proponemos el saneamiento de sus fábricas y la reconstrucción de la estructura existente configurando una nueva estructura que delimita la cara posterior de esa primera crujía. Las plantas, diáfanas con pavimento de Teka y particiones interiores opacas en la dirección perpendicular a fachada, y transparentes en la dirección paralela. se plantea como una pieza de nueva planta que se aoja en el vaciado interior. Su sistema constructivo pretende eliminar complejidad y presencia material. Forjados tipo Deck construidos sobre un entramado de pilares (HEB160) y vigas (IPE 300) permiten la máxima diafanidad de as entreplantas que, a modo de plataformas, ocupan el vacío central del edificio. La envolvente se resuelve con una piel continua de vidrio transparente y translucido, que montado sobre una subestructura metálica conecta con la cara externa de los pilares. A basic core through which all the vertical installations and conduits run (lift, toilets, documents lift, climate control conduits, riser pipes, down pipes, etc.) completes the architectural system. This prism-shaped volume runs vertically through the entire building. Indeed, it becomes its motor. 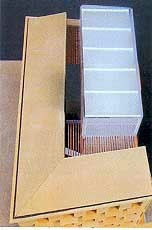 Together with the stair system that connects the different levels, this is the element that articulates and relates the two differentiated parts of the design. 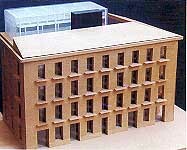 We are retaining the first bay as the built basis that justifies the conservation of the façades. We propose to make good their fabric and reconstruct the existing structure, forming a new structure that marks off the rear face of this first bay. The floors are open, with teak flooring and internal partitions that are opaque perpendicular to and transparent parallel to the façade. This is a new construction placed in the hollowed-out interior. The building methods aim to eliminate complexity and material presence. Decking-type floor structures are built on a system of columns (HEB160) and beams (IPE300), giving maximum openness to the platform-like mezzanine floors that occupy the central void of the building. 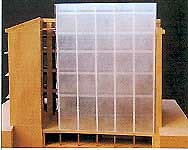 The envelope is a continuous skin of transparent and translucent glass mounted on a metal sub-structure, in contact with the outer face of the columns.